A little after 11:00 p.m., the Stockholm struck the Doria, delivering a fatal blow. The impact opened such a gaping hole in the Doria's side that within minutes the ship was leaning dangerously far to her right side -- allowing the watertight compartments that kept the ship afloat to flood. For the next several hours, preparations were made to evacuate the Doria, as the Stockholm's crew worked to assess the damage to their own ship (which did not sink). S.O.S. calls were relayed and multiple ships responded to help rescue the Doria's passengers and crew. Around 6:00 a.m. after all the survivors had been transplanted onto various rescue ships bound for New York, the Doria's remaining crew began to disembark -- forced to abandoned the beautiful ship. By 9:00 a.m. even Captain Calamai was in a rescue boat. The sinking began at 9:45 a.m. and by 10:00 that morning the Doria was on her side at a right angle to the sea. The Doria fully disappeared from sight at 10:09 -- almost exactly eleven hours after the collision with the Stockholm took place. When the Stockholm was almost put to a full stop, the Andrea Doria came skidding with her starboard side into Stockholm’s bow. The Swedish liner’s knife-sharp bow cut through Andrea Doria’s hull like it was made of butter. 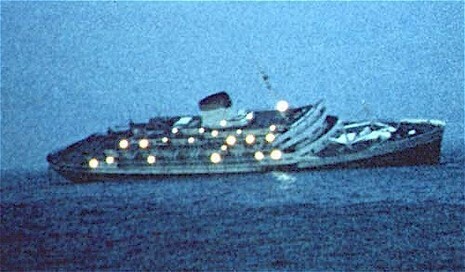 The Andrea Doria continued her 22-knot-race whilst the Stockholm stood still, badly damaged and very confused. Immediately, Andrea Doria gained a twenty-degree list to starboard. Her engines were ordered to a halt, and Captain Calamai ordered the crew to uncover the lifeboats. 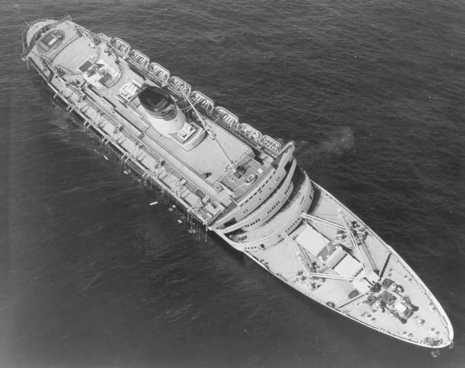 That Andrea Doria was seriously damaged was quite obvious for the passengers and information to enter the boat deck for them was not required. The combination of that the damage was in-between two different watertight compartments and the fact that the ship had such a large list to starboard sealed the Andrea Doria’s fate. Eventually, it was determined that forty-six passengers of Andrea Doria were killed in the collision area of their ship, among them Camille Cianfarra, a longtime foreign correspondent for The New York Times. Five crew members of Stockholm whose cabins were located in the bow area and were in the impact area of their ship at the time of the collision also perished: three during the collision, and two more later from mortal injuries. The deaths of two Doria passengers were related to the rescue operation. There were hundreds of injuries, some from the collision and some sustained on the listing liner and during the evacuation process. After the ships had separated, as Stockholm crew members were beginning to survey the damage, on the deck of Stockholm aft of the wrecked bow they discovered 14-year-old Linda Morgan without any major injury. It was soon determined that she had been an Andrea Doria passenger, had miraculously survived the impact, and had been somehow propelled far onto Stockholm deck. 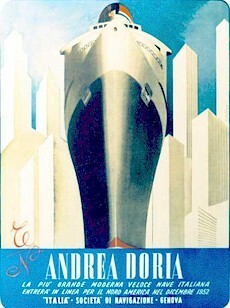 Her half sister Joan, who had been sleeping in Cabin 52 with her on Andrea Doria, had perished, as did her stepfather. Camille Cianfarra had been in an adjacent cabin with her mother, who was seriously injured but survived and had to be extricated. The body of another Doria passenger (a middle-aged woman believed to be Mrs. Ruth Carlin), was also observed lodged in an inaccessible area of the wreckage of Stockholm's bow. A search was conducted for several missing Stockholm crewmen. It was determined that five had perished, and those injured were taken to the ship's hospital. 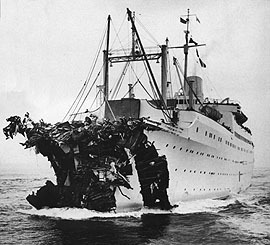 On Andrea Doria, there were serious injuries and passengers trapped in the wreckage of cabins in the impact area and many injuries from falls and so forth from other points around the ship. The lowest decks in the impact area became submerged immediately after the collision, and many of the casualties were members of immigrant families who were presumed to have drowned. 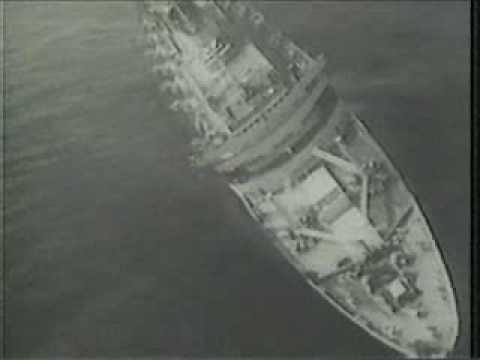 A number of injured persons received medical treatment, but more significantly, it soon became clear to those on the bridge that it would be necessary to evacuate Andrea Doria, a hazardous activity under the best conditions. Due to the list, the evacuation would prove far more difficult than perhaps any shipbuilder had envisioned. The evacuation was not helped by the fact that large numbers of crew had left the ship first leaving passengers to fend for themselves.